First Solar Inc. says it is restructuring its operations in response to deteriorating market conditions in Europe. As part of this program, the company will close its manufacturing operations in Frankfurt, Germany, in the fourth quarter of this year. Additionally, the company will indefinitely idle four production lines at its manufacturing center in Kulim, Malaysia, on May 1. 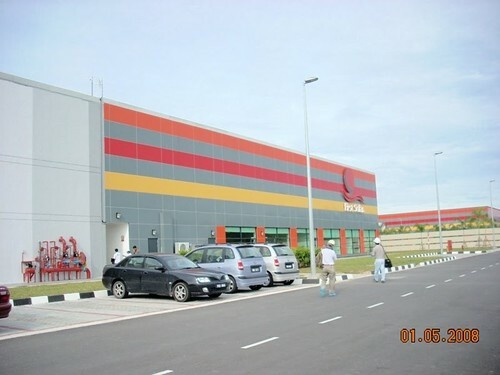 'Indefinitely close four manufacturing lines' - First Solar in Kulim Kedah, Malaysia. Image: Yeong Wei Kheen on Panoramio. These actions, combined with other personnel reductions in Europe and the U.S., are expected to reduce First Solar's global workforce by approximately 2,000 positions - approximately 30% of the total. The restructuring initiatives are expected to reduce First Solar's costs by $30 million to $60 million this year and $100 million to $120 million annually going forward. In addition, the company's average manufacturing cost is expected to improve to between $0.70/W and $0.72/W in 2012 as a result of the changes - below prior expectations of $0.74/W. First Solar estimates that average module manufacturing costs will range from $0.60/W to $0.64/W in 2013. Mike Ahearn, chairman and interim CEO of First Solar, said in a statement that the European PV market has "deteriorated," causing the company's manufacturing operations there to cease to be economically sustainable. "First Solar's decision to permanently close its German production facility and indefinitely close four lines at its Malaysian facility once again demonstrates the intense pressure that even the 'lowest cost' PV producers are under today to reduce their manufacturing costs," commented Sam Wilkinson, senior analyst at research firm IMS Research, in a statement. "First Solar's costs (per watt) had been around 50% lower than those of a typical Chinese tier-one c-Si manufacturer in 2009," Wilkinson said. "Following rapid declines in polysilicon pricing, that difference is now less than $0.10/W and is predicted to close further throughout 2012. "We've seen a number of recent examples of major Western suppliers shutting down local production of wafers, cells and modules in favor of sourcing products from Asian manufacturers as it is lower cost and offers greater flexibility," he added.